If you shy away from making homemade pies—savory or sweet—because of the crust (it can be tricky and there’s all that rolling) you are in for a treat. Meet the impossible pie. Impossible pies are just the best because they’re easy to make and always turn out so well. Impossible pies are family-friendly, too. Even your pickiest eaters are gong to love them. What makes these pies seemingly impossible? The crust starts out as a thick liquid that you pour it over the top of the pie. Then somehow in the baking process the crust finds its way to the bottom and turns into a fabulously delicious pie. All of the recipes that follow call for Master Mix, which is our homemade (cheap) version of Bisquick (somewhat pricey). 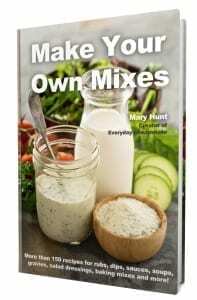 You’ll find the recipe for Master Mix below. Heat oven to 400 F. Grease a 9-inch pie pan that is at least 1 1/4 inches deep. 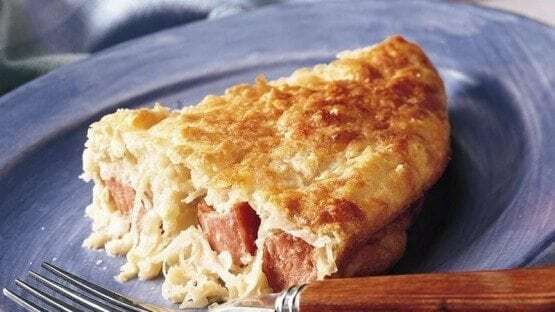 Spread the bratwurst, sauerkraut and cheese in the pie plate. In a bowl stir together the Master Mix, water, beer and eggs until well blended. Pour into pie plate. Bake 30 to 35 minutes or until knife inserted in center comes out clean. Let stand 5 minutes before serving. Serves: 6. Heat oven to 400 F. Grease a 9-inch pie pan that is at least 1 1/4-inches deep. Cook beef in a skillet over medium-high heat, stirring occasionally until brown; drain. Layer cottage cheese and Parmesan cheese in pie plate. Stir 1 cup of the mozzarella cheese, the Italian seasoning and tomato paste into the beef until blended. Spoon evenly over top of the cheeses in pie plate. Place Master Mix, water, salt, pepper and eggs in a bowl and stir together until blended. Pour into pie plate. Bake 30 to 35 minutes or until knife inserted in center comes out clean. Sprinkle with remaining 1 cup mozzarella cheese. Bake 1 to 2 minutes longer or until cheese is melted. Let stand 5 minutes before serving. Sprinkle with fresh parsley if desired. Serves: 6. Optional: If you have some spaghetti sauce on hand, heat it in the microwave to serve with this pie. Heat oven to 400 F. Grease a 9-inch by 1 1/4-inch pie plate. Spread chilies, cheese and cilantro into pie plate. In a separate bowl stir together Master Mix, water and eggs until blended. Pour into pie plate. Bake 25 to 30 minutes or until knife inserted in center comes out clean. Let stand for 5 minutes before serving. Serve with salsa. Serves: 6. Heat oven to 325 F. Grease 9-inch pie plate. Stir together apples, cinnamon and nutmeg; turn into pie plate. Place Master Mix, sugar, water, butter and eggs in a bowl and stir until blended. Pour into pie plate. Sprinkle with Streusel. Bake 40 minutes or until knife inser-ted in center comes out clean. Serves 6. Stir all together until crumbly. Tips Plate size. Pie plates vary in size from one manufacturer to another. If you use a pie plate that is too small, the pie will run over while baking so it’s better to err on the side of a larger pan. The size is usually marked on the bottom of the plate. But if not marked, measure from inside rim to inside rim. Double batch. All of these recipes for Impossible Pies can be doubled. Bake in two pie plates; or bake a double recipe in a 13 x 9 x 2-inch baking dish for about 10 minutes longer than the recipe indicates. Sift dry ingredients together. Cut in shortening until mix looks like cornmeal. Store at room temperature in a large container that has a tightly fitting cover (like Snapware or Tupperware) for up to six months, kept in the pantry. Makes 30 cups. ONE DOZEN BISCUITS: 3 cups Master Mix, 3/4 cup water. Blend and knead a few strokes. Roll out and cut biscuits with a round biscuit cutter, into squares or diamond shapes. Bake 10 minute at 450 F.
DUMPLINGS: Use the same measurements as for biscuits. Drop into hot liquid of choice. Cook 10 minutes uncovered and an additional 10 minutes covered. ONE DOZEN MUFFINS: 3 cups Master Mix, 1/2 cup sugar, 1 egg, 1 cup water. Mix water and egg; add dry ingredients. Add optional items such as blueberries, chocolate chips, nuts and so forth, as desired. Bake in muffin cups for 25 minutes at 450 F.
4 DOZEN DROP COOKIES: 3 cups Master Mix, 1 cup sugar, 1 egg, 1/3 cup water, 1 teaspoon vanilla, 1/2 cup nuts or chocolate chips. Bake 10-12 minutes at 375 F.
9-INCH ROUND COFFEE CAKE: 3 cups Master Mix, 1/2 cup sugar, 1 egg, and 2/3 cup water. Blend all ingredients and pour into a greased 9-inch cake pan. Cover with topping: 1/2 cup brown sugar, 3 tablespoons butter, 1/2 teaspoon cinnamon. Optional: Add 1/2 C nuts or raisins to the topping mix. Bake at 400 F for 25 minutes. 18 MEDIUM PANCAKES OR 6 WAFFLES: 3 cups Master Mix, 1 1/2 cups water, 1 egg. Blend only until barely incorporated. Prepare pancakes or waffles as usual. 8-INCH SQUARE GINGERBREAD: 2 cups Master Mix, 1/4 cup sugar, 1 egg, 1/2 cup water, 1/2 cup molasses, 1/2 teaspoon each cinnamon, ginger and ground cloves. Beat egg together with the water and molasses. Mix well with dry ingredients until all are incorporated. Pour into greased 8-inch square cake pan. Bake 40 minutes at 350 F.
8-INCH SQUARE CORNBREAD OR MUFFINS: 1 1/4 cups Master Mix, 3/4 cup cornmeal, 1 egg, 1 tablespoon sugar, 1/2 cup water. Mix all ingredients until fully incorporated. Pour into greased pan or muffin cups. Bake 25 minutes at 400 F.
SHORTCAKE: 2 cups Master Mix, 2 tablespoons sugar, 1/2 cup water. Mix all ingredients and bake in a greased 8 x 8 pan, or roll out and cut into individual cakes to be placed on a cookie sheet. Bake 25 minutes at 400 F, or a few minutes less for individual shortcakes, until they just begin to brown. Note: You can substitute Master Mix for any recipe calling for Bisquick. Just make sure you substitute water for any milk required in the recipe.